(Photo credit: Alexis Cuarezma/Goossen Tutor) By Dan Ambrose: Contrary to what Chad Dawson (31-1, 17 KO’s) has been saying lately about him not being hurt by coming down from 175 lbs to face WBA/WBC super middleweight champion Andre Ward (25-0, 13 KO’s) this Saturday night at the Oracle Arena in Oakland, California, the 30-year-old Dawson clearly looks weight drained in video and in photos of him. Dawson doesn’t look like his old self, and he appears a lot thinner than Ward, who appears like he’s ready to step inside the ring right now and defend his titles. He may have done his job to make weight, but I think he may be sorry for having done it. It was probably a huge error on his part to agree to fight Ward at 168 lbs in the first place. 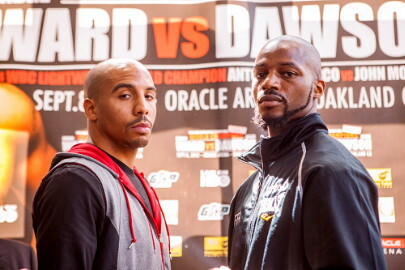 Moments after beating Bernard Hopkins by a 12 round majority decision last April, Dawson made a mistake of volunteering to come all the way down to 168 lbs to fight Ward. What Dawson should have done is say he’d be willing to fight Ward at a catchweight, because it put him in a hole by agreeing to come down to Ward’s weight to fight him instead of the two guys meeting halfway. Dawson later tried to get Ward to fight him at a catchweight, but was refused, Dawson said. The way that Dawson looks now with his face and body looking really thin and unhealthy, I don’t see him winning tomorrow night in Oakland. Not only is Dawson looking painfully thin with bags under his eyes, but he’s going to be fighting in front of a huge pro-Ward crowd in Oakland and that’s going to make it doubly hard for him to try and win this fight. As far as the fight goes, Ward will probably pressure the long-armed Dawson on the inside all night long and not give him any punching room to get his shots off. Ward has been doing this against everyone he’s been facing lately and it’s quite effective.